Unless the person asking the question has been through allergy testing, they have no idea what they’re allergic to. According to the FDA, less than 1% of the U.S. population is allergic to sulfites. In most cases I suspect the headaches are caused by histamines, but I’m not a doctor and can’t prove that either. Here are the facts: Sulphur dioxide is measure in parts per million, or ppm. Any wine sold in the U.S. with a level of SO2 greater than 10 ppm must carry the words “Contains Sulfites” on the label. European countries don’t have this law, so many consumers assume that European wine doesn’t contain sulfites. They do, but the warning isn’t on the label. In fact, all wine contains sulfites, because SO2 is a natural byproduct of fermentation. How much SO2 is in the wine you drink? Wines with no added sulphites will range from 10-40 ppm, and many dry reds come in around 50 ppm. Most table wines max out around 350 ppm. By comparison, dried fruit begins at 1000 ppm and can contain nearly 4000 ppm. High concentrations of SO2 are also found in molasses, sauerkraut, canned tuna, dried potatoes and many fruit juices, gravies and sauces. 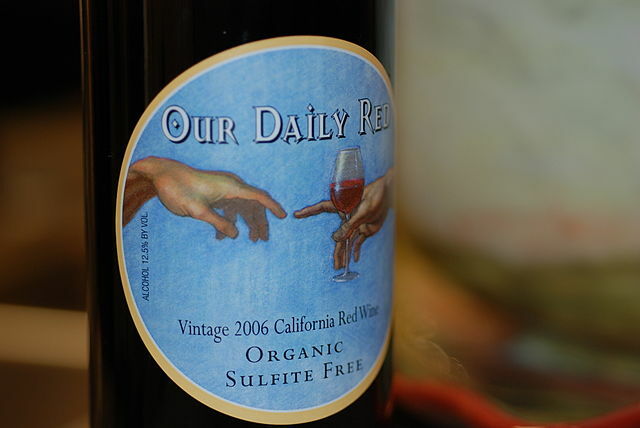 Why add sulfites to wine in the first place? The short answer is to keep wine fresh, since sulphur is a preservative. Wines with low levels of SO2 tend to be unstable and can spoil easily. The long answer is a bit more complicated. why are sulfites added to wine? Say you’re a winemaker with a production of less than 50,000 cases, located anywhere in the world. The odds are good that you have a physical plant capable of processing most or all of the grapes that come in during harvest. The fruit goes through the facility without delay, with little need to add excessive amounts of SO2. If you make 500,000 cases or more the scenario changes dramatically, particularly if you’re in a warm climate. You have a tsunami of fruit coming at you all at once, with no place to put it. The temperature outside sometimes exceeds 100 degrees Fahrenheit. If you don’t do something, those grapes are going to start fermenting spontaneously, before you’re ready to turn them into wine. You do one of two things: you either spray the grapes with SO2 to prevent them from fermenting naturally, or you go ahead and crush them and infuse the juice with SO2 to ward off fermentation until you’re ready. In California, it’s not unusual to find wineries that produce a million cases or more each year, and in some instances up to ten million. If you’re making ten million cases, you’d need a winery the size of Cleveland, Ohio to process all the grapes at the same time. The conclusion is obvious. The larger the winery, the more sulphites you’ll have to consume. Since most of the wines in supermarkets and big retail chains have a production of 500,000 or more cases, it’s safe to assume that most of them fall into this category. This answers one of the other frequently asked questions: “How come I go to Europe and drink wine all day long, and it doesn’t affect me, but here I have a headache after a glass or two?” For one thing, you’re on vacation and your stress level is lower. Your phone isn’t going off every 30 seconds, your boss isn’t harassing you, your daughter isn’t calling to tell you she’s eloping with the plumber. The other reason is that you’re likely drinking local wine, made by the guy up the road in very small batches and devoid of excess SO2. There’s a great deal of confusion about these terms. To put it simply, organic and biodynamic are farming practices, while natural wine refers to cellar handling. There’s no formal definition of a natural wine, but most people understand it as a product that nothing has been added to (or from which nothing has been removed) during the winemaking process. Most natural wines are either organic or biodynamic as well. Critics of natural wine contend that the term is meaningless, and they are technically correct. The definition of organic varies from one place to another. Here in the U.S., a property must go through a program of soil testing and grow grapes for three years without any pesticides or chemical fertilizers to be certified as organic. Organic wines must have no added sulfites, and cannot have naturally occurring sulfites in excess of 20 ppm. These rules may sound stringent to us, but they are merely the starting point in some other cultures. 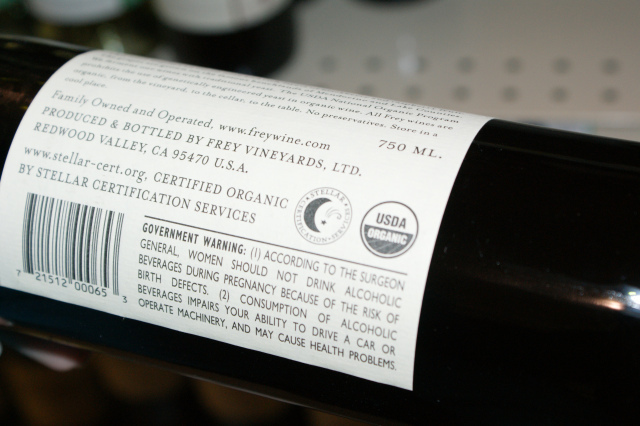 There are any number of certified organic wines made in the U.S. that are not labeled as such. Consumer prejudice against organic wine is widespread and goes back to the early days of the movement, when such wines were excessively earthy and spoiled easily. Fetzer was a pioneer of organic farming in Mendocino County, and was one of the first wineries to combine sustainable farming with palatable wine. The practice is now starting to catch on in other parts of California, largely in response to public demand for a cleaner and healthier product. Biodynamic farming is another subject entirely, and a far more controversial one. The biodynamic movement is based on the teachings of Rudolph Steiner, who gave his initial series of lectures on the subject in 1924; the certifying body is the Demeter Association. There are some very famous properties that subscribe to this method, including Domaine Leroy in Burgundy, Zind-Humbrecht in Alsace and the Rhone Valley’s Maison Chapoutier. There are many practitioners in California as well, although they are even more reluctant to admit it than organic farmers are. What’s so controversial about the biodynamic method? On the surface, not much. It treats the entire vineyard as a single organism, and advocates the use of natural composts and herbal preparations to treat the soil. But it does include some strange practices, such as burying a ram’s horn filled with cow dung in a vineyard by the light of the moon. This may or may not improve the quality of a vineyard site, but it is one of the things that causes critics of biodynamic farming to label it a cult. To nonbelievers or skeptics, the religious fervor of biodynamic followers is sometimes frightening. It's not my intention to poke fun at those followers, but simply to inject some common sense into the discussion. If the cow dung inside a ram's horn would really improve the quality of a vineyard, then burying a coin-filled coffee can in my backyard would certainly make me rich. We started out with some people getting headaches, and ended up with others performing sacred rights while bathed in moonlight. In the end, it all comes down to the golden rule of wine drinking: know your producer. Some consumers may be leery of homework, preferring just to drink the stuff and be done with it. 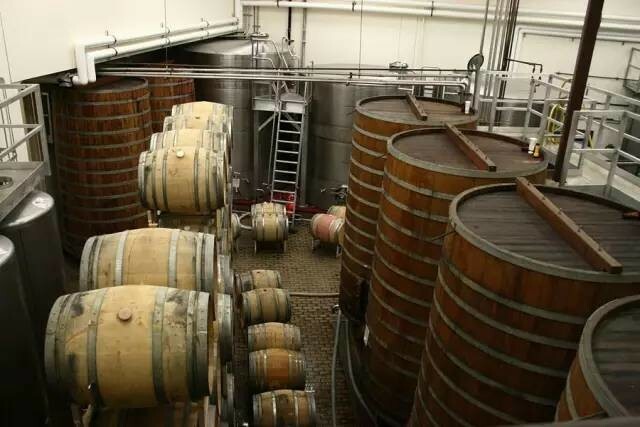 Becoming familiar with a winery’s farming and cellar methods will take you a long way toward consuming wine that is free of additives---whether those additives are dangerous or not. The amount of sulphur in a wine may be hard to quantify, but ultimately you’ll know whether a particular winery’s style is pleasant and beneficial. How do you feel about sulfites in wine? Do you have a reaction when you drink certain types of wine? Share your comments and insights with the community!